ALF Summer, year three is in session! It’s been the most fun and collaborative ALF Summer yet. Last year, @artbrock spent many, many hours working on our Starter Kit with the ALFs and launched the Beta Starter Kit at the end of the summer. Since then, we’ve had around 500 downloads from around the world and have more than doubled our number of start-up ALCs. So many of our ALF Summer participants have already been in collaboration with someone from our network before coming, as well as already working within their own communities to create an ALC of some kind. Week one of ALF Summer consisted of two days of planned offerings to support people new to ALC, as well as planned offerings for those who have already been to an ALF Summer (returning ALFs). And, of course, we simply acknowledge that everyone is an adult and has the free choice to attend whichever session feels best to them to be in. We simply recommend that new ALFs have some foundational content given to help them understand what an ALC is before diving into the rest of the fun. The next 3 days of the first week was the creation of an ALC, where offerings were made and planned in a more open-space format. I decided to offer a session called “The Art of Facilitation & The Facilitation of Art” which is what this blog post is specifically about from here on out! I feel like I am bursting with stories I want to share about facilitating with children and how I have evolved through the past three years as I have been on this journey with Mosaic. However, as I experience ALF Summer for the third year, I am striving to create a place where more sharing can happen more naturally, in a way that might appeal to a more traditionally feminine way of sharing traditions and culture. I imagine woman sitting in a circle sewing, canning, weaving, and talking. I had this thought recently about how societies have developed over time to appeal to the masculine. From my perspective, the dominant culture is male created and driven. I was thinking about how for many centuries before written language, most of history and learning was passed down through oral communication and story telling. I recognize that after the written word was created mostly men have been writing and passing down history, and this could be a contributing factor to how societies have become driven by masculine energy over time. I believe in a powerful union of masculine and feminine energy. What I am holding for is a balance of this expression of energy so that our ALC Network becomes one that holds both men and woman sacred, equally. While the world predominately wants facts, figures, proof, there is another type of communication that can happen through vibration, togetherness, and nurture. All people have both masculine and feminine energies in their bodies, their fields and their psyches. Feminine energies tend to be felt on the left side of the body and masculine energies on the right. We all have inner relationships made up of our inner masculines and inner feminines. It is very worthwhile to spend time getting to know these inner agents and to heal them using the Divine Feminine and Divine Masculine. positive attributes: active, intelligent, logical, rational, linear, determined, reliable, strong, stable, protective, sensible, heroic, focused, single-minded, practical, goal-oriented, consistent, predictable, capable, smart, rugged, ordered, disciplined. negative attributes: rigid, stubborn, aggressive, tough, ruthless, violent, non-communicative, self-centered, authoritative, dominating, dogmatic, closed-minded, autocratic, rule-bound, heartless. positive attributes: soft, warm, sweet, kind, loving, nurturing, gentle, creative, receptive, flexible, adaptable, yielding, forgiving, understanding, caring, care-giving, serving, passive, peaceful, open-minded, beautiful, mysterious, spontaneous, ever-changing, inspirational. negative attributes: weak, emotional, irrational, illogical, unpredictable, bitchy, stupid, powerless, manipulative, controlling, indecisive, fickle. When I hear myself and other woman lament about how “emotional” they are, I recognize the experience of immature feminine is present. When the world values goal setting, logical explanation, linear thinking (masculine expressions) over spontaneity, working from a place of inspiration, and constant change (feminine expressions), this leads to feminine energies within us feeling crazy, emotional, or that we don’t fit in or belong. So when I see offerings of a Set the Week board where we are scheduling times and places for certain conversations to happen, with particular outcomes desired, I see that this meets the needs for the masculine energy and desire for logical and predicable way to have outcomes we want. Then around (or during) those scheduled offerings, there is the time for the spontaneous feminine energy to shine, where you don’t know what will occur, but inspiration might strike and the outcome can lead to something beyond our imagination! This week I felt a little out of place at times. Over the past three years I have slowly become more balanced internally with my own masculine and feminine energy. I have recognized where I have become conditioned by my schooling and American culture to value mostly the masculine energy within myself and to express that more than the feminine. This has led to me expressing those negative characteristics of both the masculine and feminine in the list above many times! I am in the process of de-conditioning myself and allowing myself to be more spontaneous, more nuturing, more understanding, more of all the positive aspects of my divine feminine nature. Whereas three years ago at ALF Summer I was all about planning every minute of my day to maximize efficiency and productivity, this year I found myself wandering the halls and longing for a moment of inspiration to strike me into a flow that felt wondrous. I have been trained in my life that I need to force every minute to count productively rather than allow every minute to be lived in wonder. 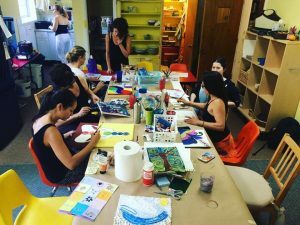 I wanted to connect with other people, so I offered what felt to me like a setting that would encourage the feminine energies within us to connect: A room full of art supplies and seating in a circle-ish form where a group of people could be creating and talking and talking and creating. Not only was I hoping to appeal to the feminine energy, but I was wanting to provide a living example of how much of “education” has happened for most of human evolution: orally. Most of the time at ALC, I see children learning when they are in communication with others just talking about their thoughts and observations of the world. This is hard to quantify and relay to the masculine, data-driven world, that most of the education and culture creation happens through organic and spontaneous conversation that cannot be planned for. And this is a rich, deep and dynamic education that is beautiful and honors those feminine energies within. I felt like the sharing part was hard for me at first. Where I imagined a group of people working and talking and having the conversation flow naturally, in reality, I felt this anxiety about if I the people who came would walk away thinking it was time well spent. It didn’t feel natural or organic to just start telling them things about me facilitating. Nari, our participant from Cairo, looked up with me with this warm smile, and a twinkle in her eye and asked me to share about how I came to create Mosaic, and that provided the start to a Q & A format. I still felt nervous at times because I felt like I was talking too much and it wasn’t matching this ideal picture in my head. I also recognized that I was internally struggling with how to fit in this offering with the rest. I noticed that few men came and there was a part of me that thought this offering was perceived as a silly thing to do, like something “cute” that I was doing but not as valuable as a marketing session or a session on organizational structures of a school. What I realize I desire is to see our ALC community fully value the both the feminine and masculine aspects of what makes an ALC magical. The children need both. You can logically plan an ALC for years and spend lots of resources and time marketing it, but in the end, you need to have place that feels nurturing, that inspires, that can flexibly respond to the needs of the children. There is no class or workshop that can train a person to ALF with children, it’s an experience that grows and evolves within you over time. It’s the experience of being WITH others that helps you understand that connection is more than words and rational thinking, that ALFs and kids can intuitively connect and communicate without words (or even using Language that Moves Things), we can look at each other and understand how to give and receive compassion. It is crucial to me that others starting an ALC know that planning, logistics, marketing, and knowing in your head what to do isn’t enough. Feeling, BEing, and operating from intuition and your heart is how you truly connect with others and create change in a world that is desperately in need of balance of masculine and feminine energy. I honestly can’t remember all of what was shared because I didn’t take any notes. Some things I remember speaking to that might be of value to other facilitators were about (1) how to create an inclusive culture (avoiding cliques) and (2) how our Change Up Meetings have evolved to better serve the children. (1) Inclusive Culture: I stressed the importance of connection. Jess and I have reflected in the power of the spawn points and creating intentional space for the children to connect with each other in a smaller group. The kids spend time playing games, talking about a problem they have, doing feeling check-ins, or answering questions about themselves. You can force children to include each other, but then they are including others from place of “this is what I’m supposed to do.” I prefer seeing people really in connection with one another, hearing about how others think differently from them and being able to ask the group for what they need, i.e. “When I’m really upset, I like to be left alone” or “I don’t know how to join anyone during the day, could someone invite me to play today because I’m not sure what I want to do.” Reaching out to others from a place of genuine compassion and care comes more readily and easily when you feel like you know the person, so Spawn Points are a great opportunity to facilitate conversations (or games) that lead to deeper understanding of one another. I also stressed that it just takes time for this to develop. People need time to get to know each other and see each other. During our first year of school there were lots of conflicts, including many physical ones between the kids. This past year (our third year), has been so much more peaceful and easy. The kids know each other and trust each other more. I know them and trust them more, and vice versa. We also make an effort to really talk about what we value and check in on those values as a community with each other. You can read my blog post about our end-of-year rituals (please click within that blog post for the school report card link which dives even deeper) that have developed to get more context about that. (2) Change Up Meeting: Many kids struggle with large meetings and do not want to talk about better and more efficient ways to clean up the school or keep the school quieter. It’s important to remember that ALCs honor “People Over Process,” so if your Change Up meeting is a horrible experience for the kids, everyone is empowered to remember what the purpose of the Change Up Meeting is (take make our community flow with more ease with one another, for example) and decide how to go from there. One item to note is that the items in the “Awareness” column of the Change Up board do not have to stem from things you notice need to be better. At the beginning of this school year, we had students, staff, and some parents come together to write a wish they had for the community. At our Change Up meetings, each week we would pull a wish from a bag and read it aloud and decide if there were ways we could implement any practice to make the wish come true. Children are much more excited to “grant a wish” than to feel like they have to discuss some awareness that an adult brings up. One example of this is when we pulled a student wish that “Everyone felt really connected.” To grant this wish, the kids decided that they wanted to try out playing one big group game every week and that we try doing this as a whole school. We did this for weeks, and eventually we made this optional for people to join, but now it’s in our cultural DNA to play group games together so we can be connected to one another. I also shared about some of the ways Jess and I evolved Change Up over the year to better serve the kids. Jess would sing silly songs sometimes to start, because the kids really wanted to move their bodies and be silly together. We also started limiting the number of topics to discuss to 4. We would quickly go over what was in Mastery and Implementation, and if something felt like it needed more discussion, we would pull it aside. We would pull up to three topics for discussion aside, and then also pull a wish (as described above) to grant. Then the kids would self select which topic they wanted to dive deeper into to work on a solution and have 10 minutes to talk together about. We never really had issues getting people in each group, if one topic was empty, we’d just point that out and people would shift. This is a wonderful practice in trust! When the group comes back together as a whole, each team would present what they think we could implement in regards to the topic. Unless it was totally off-base, which it typically would not be, we would try it out for a week and see how it goes. This practice really helps get all the students engaged, because some of them really just won’t speak up in a big group, but will much more readily speak up in a small group. I know we discussed other things, and if anyone who attend this offering remembers anything else, please share in the comments or in the documentation folder we created for ALF Summer 2016! Ah, this was really good and refreshing to read. A nice cap on the lessons I learned at ALF summer.